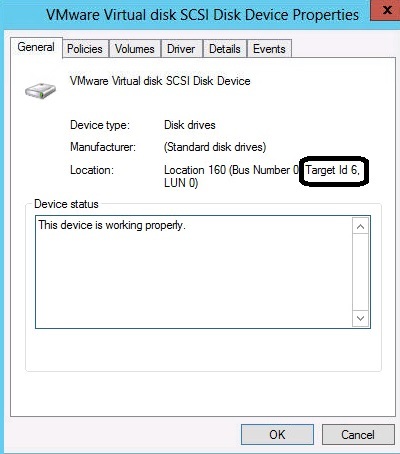 How to find which VMDK is associated with which disk in Windows Server. 1. Login to the client and edit the VM . 3. Login to the windows Guest VM – Go to the Disk-Management. 4. Right click the Disk and Go to the proprieties. Check the other blog to identify host , datastore and vCenter of the running VM . This entry was posted in ESX command, VMware, Windows and tagged disk, VMDK, Windows VM. Bookmark the permalink. 1 Response to How to find which VMDK is associated with which disk in Windows Server.